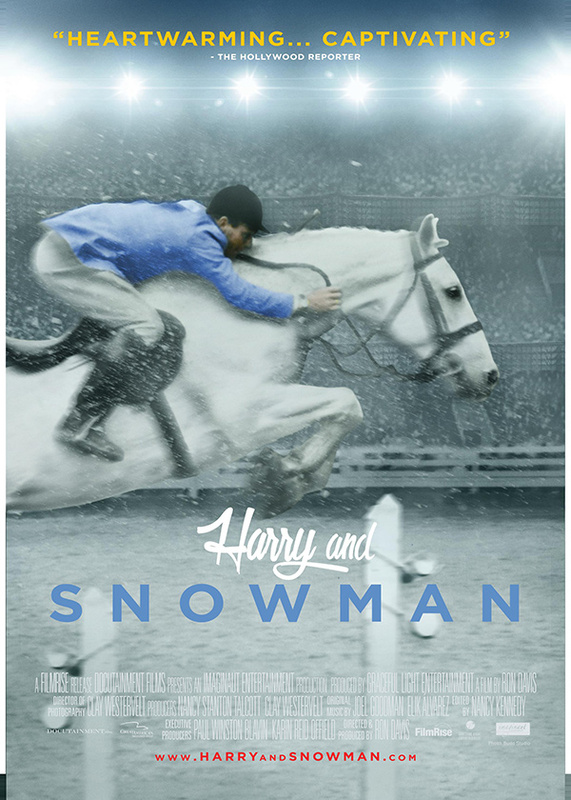 Harry & Snowman is a movie based on the life of Harry DeLeyer and his horse, a rescue from the meat truck that went on to win blue ribbon after blue ribbon, including the Open Jumper Championship at Madison Square Garden – two years in a row. I spoke with Ron Davis, who directed and produced the film, which is available on Netflix. 1. What was your involvement with the Harry & Snowman film? I was the director and the producer. 2. What struck you most about the story? It was a love story between a man and his horse. I thought it was so endearing. I knew how it made me feel and I thought the audience would respond well to it, as they have for almost 60 years now, even though he’s moved on. 3. What did you enjoy most about directing the film? I really enjoyed meeting Harry and interviewing him, getting to know his family. I was able to hear the story from a first-hand account, rather than from the book, articles. 4. What did you find most challenging about directing horses? I didn’t really direct the horses, because it was all archival; so all the film was from the ’70s. 5. Did anything especially funny happen during filming? 6. Do you have any horse experience? I rode as a junior. I did the hunters and equitation, in New Jersey and on the East Coast, but I stopped riding in my mid-20s. Most of my closest friends remain in the business. 7. What do you hope that people will take away from watching the film? I hope that people will walk away with a really warm, good feeling. That they have just seen a true story that is inspiring, and hopeful, and full of love. Everything is so negative in the world now, that a really simple story and an animal can bring you so much joy, so much happiness. This was an animal that was going to be thrown away. 8. What was it like working with Harry and his family? He was like a big ham. He was willing to do whatever it took. He was a lot of fun. It was like having a grandfather; a jovial grandfather. 9. In the book, The Eighty-Dollar Champion: Snowman, The Horse That Inspired a Nation (by Elizabeth Letts), Harry talks about a film that he was working on; that he was supposed to be choosing the horse that was going to play Snowman; this is a different film than the one he was speaking about? That was a film that was supposed to happen in 1960. MGM was supposed to make that movie in 1960, but they never did it. 10. Do you have any upcoming projects you’d like to share? My next film is called Life in the Doghouse. It’s about renowned equestrian Danny Robertshaw and Ron Danta, they’re a big deal in the U.S. Their dog rescue called Danny & Rob’s Rescue, where they have single-handedly saved/found homes for over 10,000 dogs.